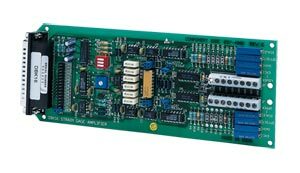 A two-channel strain-gage expansion card for OMEGA’s OMB-LOGBOOK and OMB-DAQBOARD-2000 Series data acquisition systems. The OMB-DBK16 is a general-purpose card that accommodates the connection of most strain-gage types, from single-element quarter-bridges to 4-element full bridges. The OMB-DBK16 also includes provisions for bridge completion resistors and provides four adjustments on each of its two channels. You can adjust excitation voltage, input gain, offset nulling and output scaling. Up to 128 OMB-DBK16 boards can be connected to one OMB-LOGBOOK or OMB-DAQBOARD-2000 Series. For applications of 5 or more channels, use the 8-channel OMB-DBK43A strain-gage module. The OMB-DBK16 accepts user-supplied excitation input voltage from 12 to 16 V on each channel. Its on-board excitation regulator can be adjusted from 1.5 to 10.5 Vdc. OMB-DBK30A rechargeable battery/excitation module or by a user-supplied source. Each channel of the OMB-DBK16 offers switch-selectable AC or DC coupling between the input amplifier circuits and the filter stages. A selectable three-pole low-pass filter with a cus-tomizable cutoff frequency is also provided.